We've seen a bunch of recent leaks about the incoming Pixel 3 and Pixel 3 XL phones from Google, but up until now the date of the launch remained a mystery. That mystery might just have been solved thanks to some people in the know tipping off Bloomberg. According to Bloomberg's sources, Google has an event scheduled for Thursday, October 9 in New York, where it will show off its new phones – as well as (perhaps) a Pixel Watch and a new Pixelbook. If you're a fan of Google's hardware, we'd suggest you start saving up now, and mark the date in your diary. This contradicts an earlier leak suggesting the phones would debut on October – just like the original Pixel and Pixel 2 handsets before them – but considering Bloomberg's track record we'd say the October 9 date is the more likely one right now. Of course nothing is set in stone until it's made official by Google – the company had no comment in response to Bloomberg's report, but it's now almost certain that the Pixel 3 phones are going to make an appearance in the first week or two of October. 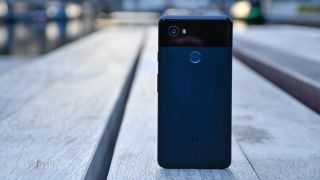 Not that Google will be able to throw out many surprises, particularly for the Pixel 3 XL: we've seen the phone leaked from all angles, together with details of spec improvements that include an upgraded front-facing camera. As well as the usual performance boosts, the phones are guaranteed to arrive running Android 9 Pie. The same Bloomberg report spills a few more beans on the upcoming iPhone 9 and iPhone 11 devices too, which are expected to arrive about a month before the Pixels. For more on those Apple rumors, check out our most recent iPhone write-up.